Sprayer Shipping Services in All 50 States! Talk to Tractor Transport to ship your farm sprayers anywhere in the US, Canada or Mexico. Depend upon us to ship your farm sprayer where you want it, when you want it. Talk with one of the experienced logistics professionals at Tractor Transport today, (877) 373-0109. 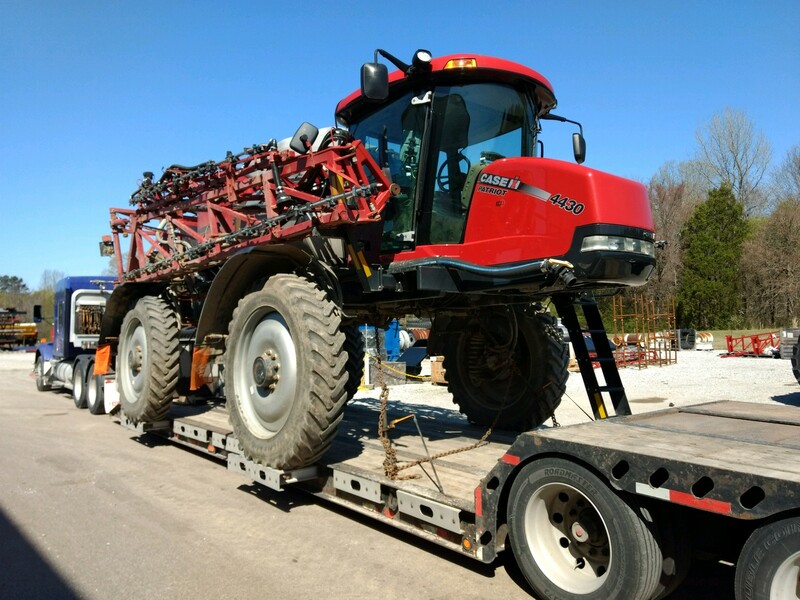 Tractor Transport recently transported this 2014 CaseIH Patriot 4330 Sprayer from Byhalia, Mississippi, to Aberdeen, South Dakota. The journey was more than 1,550 miles long. Weight: 32,000 pounds. Length: 30 feet. Width: 11 feet 5 inches. Height: 12 feet 1 inch. 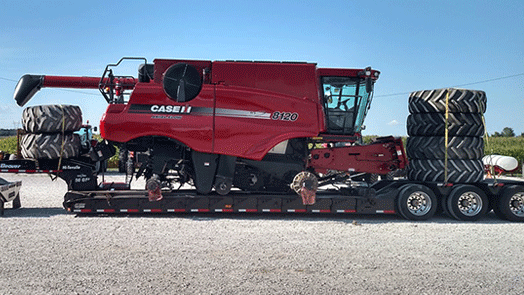 To transport your CaseIH sprayer to its next workstation, call Mike at Tractor Transport directly at (954) 603-2324. 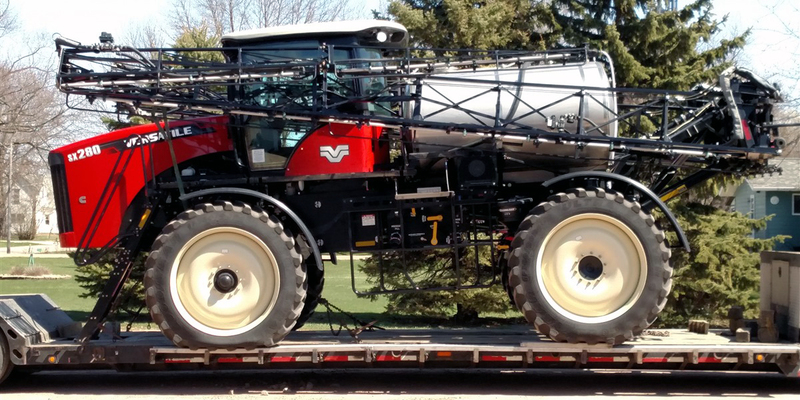 Tractor Transport recently shipped this Versatiles SX280 Sprayer from Inwood, Iowa, to Ada, Minnesota. The journey was nearly 320 miles. Weight: 29,000 pounds. Length: 27 feet. Width: 12 feet. Height: 12 feet. To ship your sprayer to its next workstation, call Sam at Tractor Transport directly at (954) 703-1105. 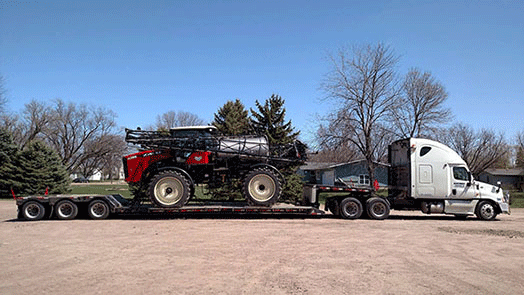 Tractor Transport recently transported this Spra Coupe 3440 Sprayer from Dewitt, Iowa, to Esbon, Kansas. The trip was more than 530 miles with an oversize load. Weight: 10,000 pounds. Length: 18 feet. Width: 10 feet. Height: 10 feet. To transport your farm sprayer anywhere in the US, Canada or Mexico, call Ty at Tractor Transport directly at (954) 839-8629. 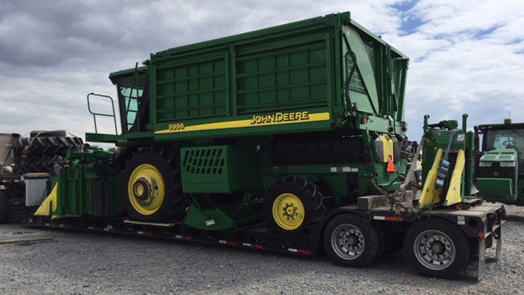 Tractor Transport shipped this 2015 John Deere R4038 sprayer. This transport was oversized and did require permits during its 820 mile journey through 4 states from Osceola, AR to Orleans, NE. 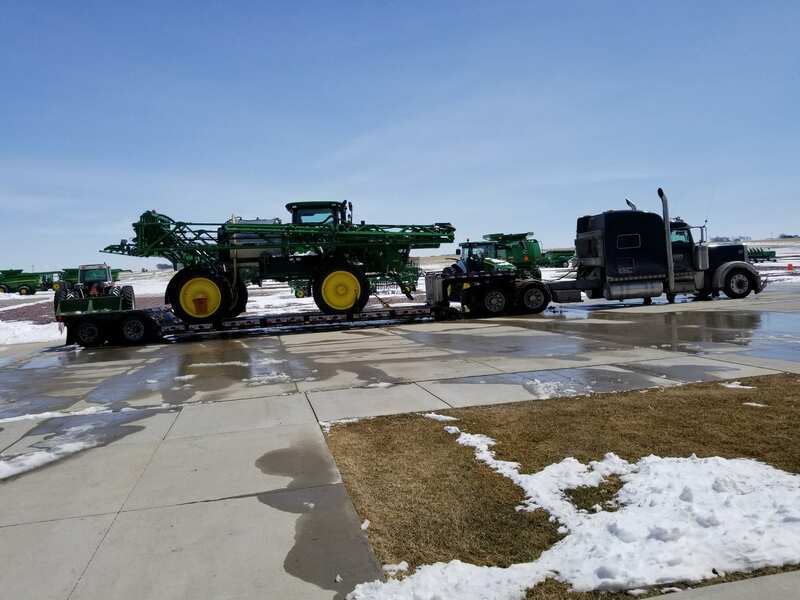 This John Deere Sprayer was 33,000 lbs. 36 ft. 6 in. in length, 12 ft. 5 in. wide and 12 ft. 8 in. high. 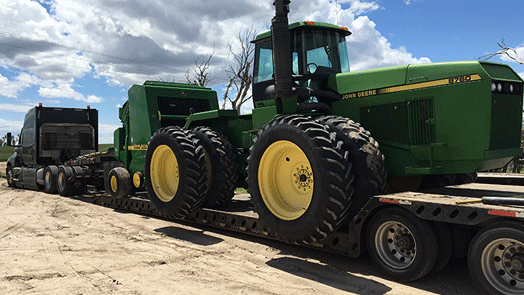 Call our agent Jamie H. to schedule your next oversized shipment with Tractor Transport! (954) 210-7609. 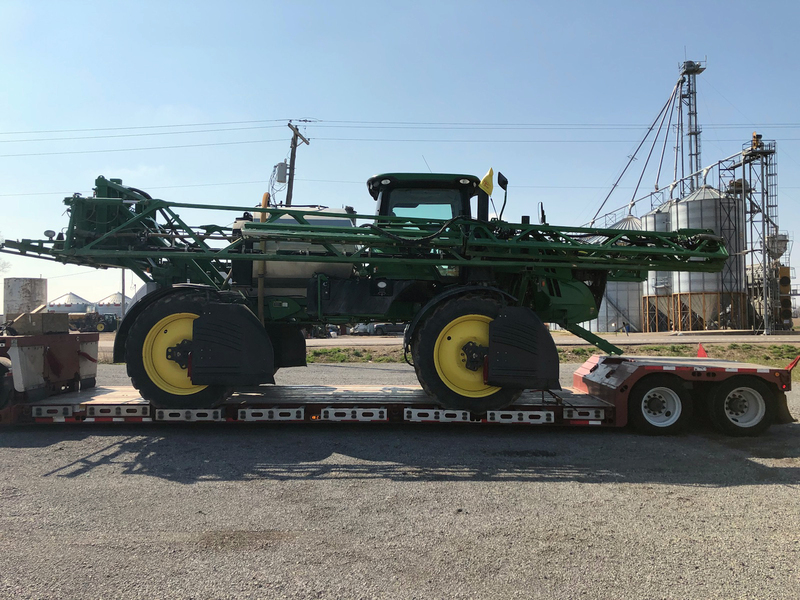 Tractor Transport recently shipped this John Deere R4038 Sprayer from Osceola, Arkansas, to New Orleans, Louisiana. The journey was nearly 820 miles. Weight: 33,000 pounds. Length: 36 feet 6 inch. Width: 12 feet. Height: 10 feet. To ship your sprayer to its next workstation, call Jamie at Tractor Transport directly at (954) 210-7609. 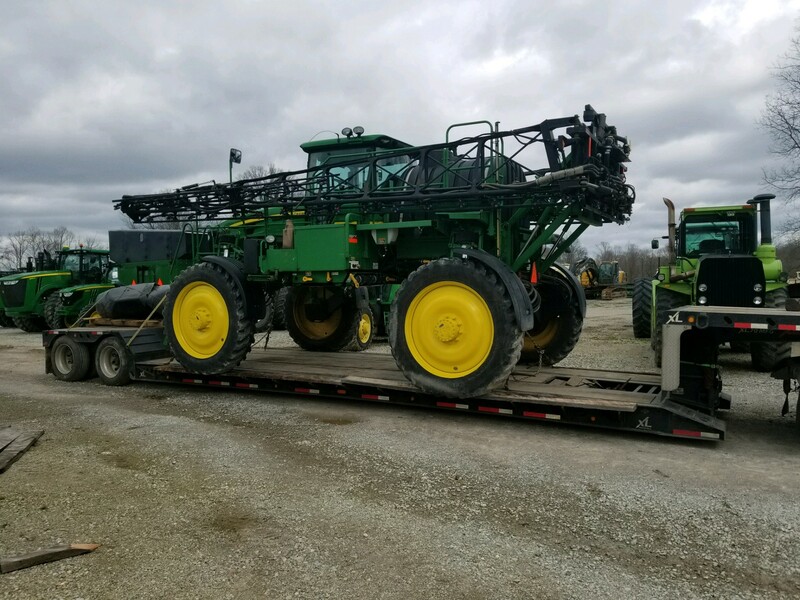 Tractor Transport recently hauled this John Deere 4730 Self-Propelled Sprayer from Dupont, Indiana, to Portageville, Missouri. The journey was nearly 380 miles. Weight: 23,000 pounds. Length: 25 feet. Width: 11 feet 4 inches. Height: 13 feet. To ship your sprayer to its next workstation, call Mike at Tractor Transport directly at (954) 603-2324. 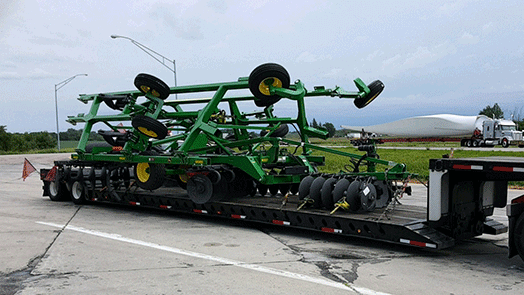 Tractor Transport recently shipped this John Deere R4045 Sprayer from Oxford, Alabama, to Grand Forks, North Dakota. The journey was nearly 1,450 miles. Weight: 27,000 pounds. Length: 35 feet 1 inch. Width: 12 feet. Height: 13 feet. To ship your sprayer to its next workstation, call Sam at Tractor Transport directly at (954) 703-1105. 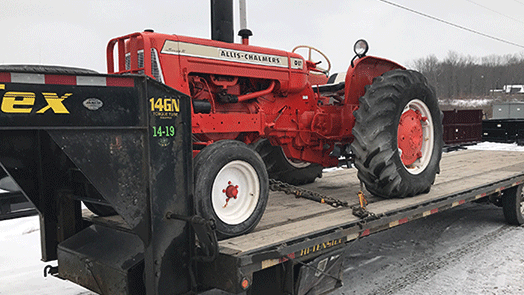 Tractor Transport recently transported this Miller Pro 750 Pull Sprayer from Elkhorn, Wisconsin, to Lewisburg, Pennsylvania. The trip was almost 750 miles long. Weight: 10,000 pounds. Length: 22 feet. Width: 12 feet. Height: 12 feet. To haul your pull sprayer to its next destination, contact Brian at Tractor Transport directly at (954) 603-1344. 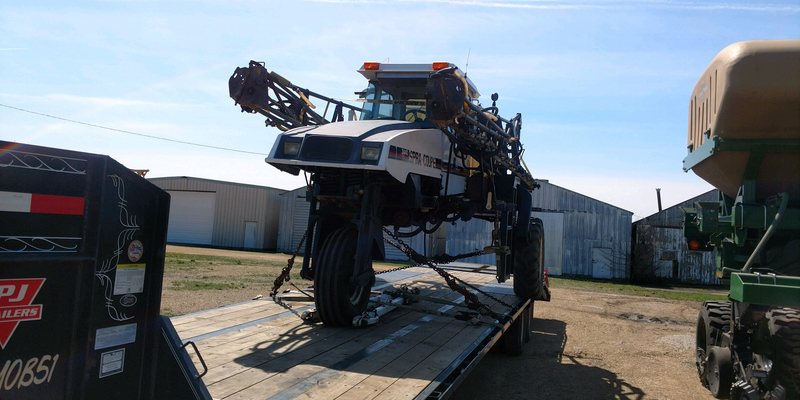 Tractor Transport recently hauled this Demco HTH 1000 Pull Sprayer from Hagerstown, Indiana, to Moses Lake, Washington. The trip was 2,175 miles long. Weight: 3,500 pounds. Length: 25 feet. Width: 8 feet 3 inches. Height: 7 feet 4 inches. 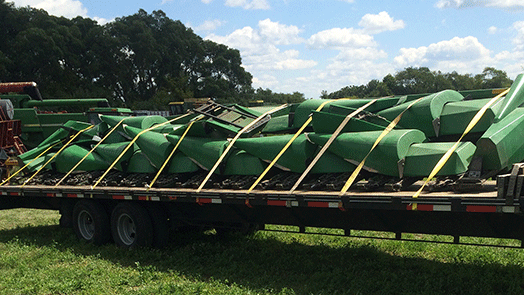 To haul your pull sprayer to its next destination, contact Ty at Tractor Transport directly at (954) 839-8629. Farm sprayers apply liquid pesticides, herbicides and fertilizer. Most pull-type sprayers are low-pressure sprayers, which are easier to maintain than high-pressure sprayers. Sprayers also can be mounted on tractors. Self-propelled sprayers usually come with high-clearance tires to avoid damaging crops. Sprayer booms can extend to more than 40 feet. 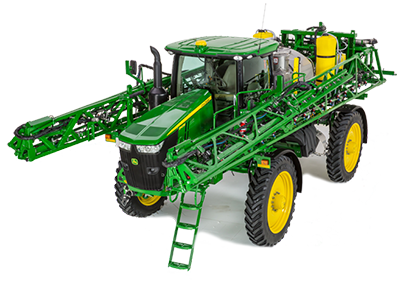 High-pressure sprayers deliver pesticides in a wider range than low-pressure sprayers. High-pressure sprayers are used to cover areas that are difficult to reach, such as an orchard of trees. 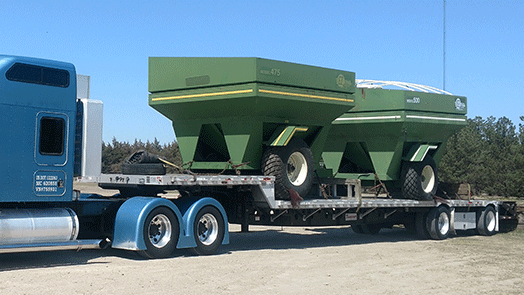 Choose Tractor Transport to ship your farm sprayer. 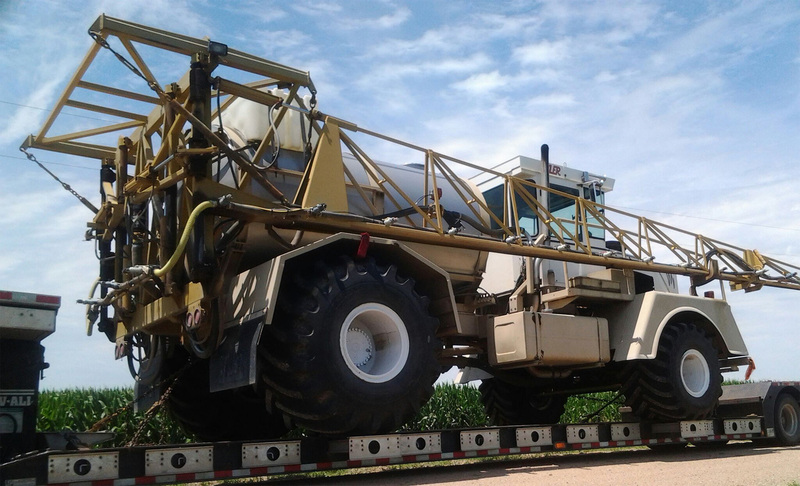 Most self-propelled sprayers travel as oversize loads aboard RGN trailers. Height is an issue because of the oversized tires. The largest self-propelled sprayers require RGNs with outriggers to support the tires. Smaller self-propelled sprayers can travel on a RGN as a regular load. 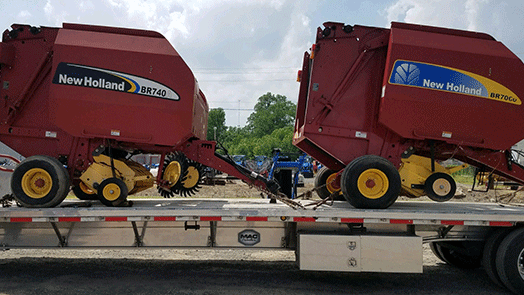 Larger pull-type sprayers also travel aboard RGNs, with their booms facing the rear of the trailer. 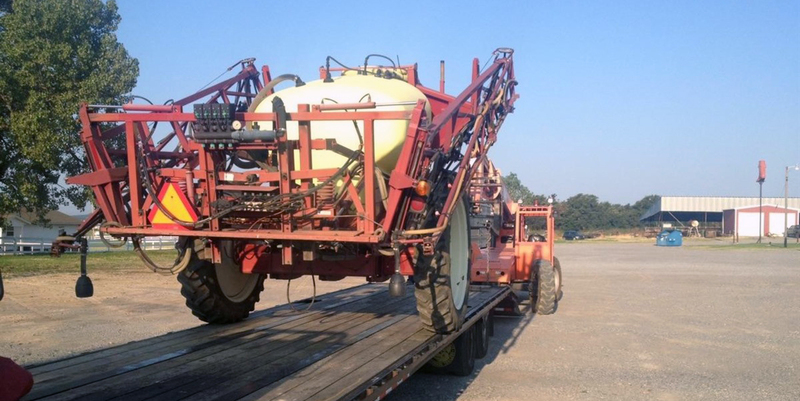 Smaller pull-type sprayers are transported by flatbed trailer or step-deck trailer. Make sure you have a crew, a dock or a forklift to help load your sprayer aboard a flatbed.